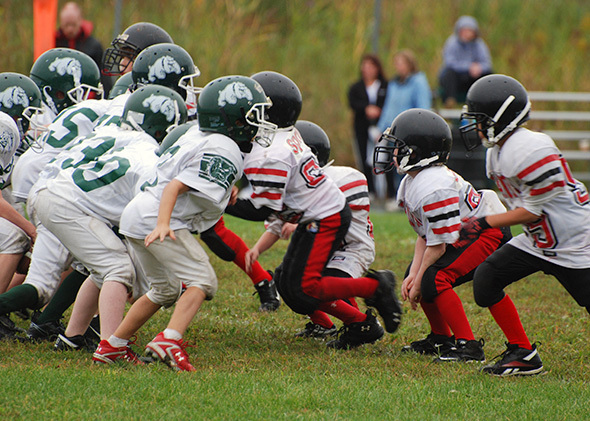 Home > Sports Psychology > Safety > Pop Warner football lawsuit: Is kids football an abnormally dangerous activity? Is youth football an “abnormally dangerous activity”? And if so, should kids be allowed to play it? The first of those questions is raised in a complaint recently filed in a federal court in Wisconsin. Debra Pyka, the bereaved mother of a young man who committed suicide, is claiming that her son’s involvement in Pop Warner football led to traumatic brain injury that eventually sent him into a spiral of paranoia and depression, culminating in his death. Her son, Joseph Chernach, played on a Pop Warner youth football team from the age of 11 through 14. An autopsy revealed that Chernach had chronic traumatic encephalopathy (CTE), a type of brain damage sadly predictable in middle-aged and older men who have played football, but rare for someone who died at age 25. (Concerned about the danger of such brain damage, San Francisco 49er Chris Borland just announced his retirement after his rookie year.) Briefing on the case should be completed this week, and then the court will decide whether the claim can proceed.